Originally released in 1987 on cassette only, the recording features songs and guitar solos by John Duarte and Gershwin (arranged by Duarte). Duarte said of it: 'These performances of my music are the kind that every composer hopes for but rarely has the good fortune to hear. I can't speak for George Gershwin but I'm sure he would have joined in the chorus of approval'. Jacqueline Fox ( mezzo soprano ) has been a member of the BBC Singers for many years and has toured extensively and recorded with them. The duo has given many concerts throughout the UK and appeared several times at the South Bank. The fretted, plucked-string instruments have been used from the very earliest times to accompany the human voice; a task to which they are very well suited by their contrasting tone quality, sufficient but not excessive volume and, since the heyday of the lute (16th-18th centuries), their keyboard-like ability to provide melodic lines, counterpoint and harmony. Some of the finest songs of the Renaissance times were those written with a lute accompaniment by, among others, John Dowland and Thomas Campion. The classic guitar was born with the 19th century, throughout which it was the constant handmaiden of singers, predominantly in the salon or the domestic drawing room. The songs written in that period rarely required the guitarist to do more than supply simple chords and arpeggios, and, as did lute-songs of earlier times, used the same music for each verse or stanza. In the 20th century the guitar, in many variant forms, has become perhaps the most common accompanist to singers of all kinds - folk, skiffle, rock, and in the more 'serious' area of 'art-song'. The use of the guitar in this last connection has, too, become more 'pianistic' in its fuller deployment of the instrument's capabilities and in its integration with the voice, to form a more equal partnership rather than to remain innocuously in the background. The Five quiet songs were written in 1968, one year after the tragic and unexpected death of the great French guitarist Ida Presti at the age of 43. Their connecting thread is thus the subject of human morality and transience, with an affirmation of faith in the final song - Ida Presti was a devout Catholic. In 1982 the American guitarist Alice Artzt suggested that I write a homage to Presti, who had been one of her teachers; my response was Idylle pour Ida. The piece reflects the lyrical side of her nature and, in the central section, both her more mischievous and serious 'faces'; it remembers also her fondness for passages in which open and stopped-string notes are run together in bell-like fashion - the campanella effect. Though it has its more mournful aspects, the theme of friendship and love - that of my other song-cycle, is more cheerful. The happier aspects gradually displace the painful ones as the cycle unfolds. No further explanation is needed than that the work was written for Jacqueline Fox. who, accompanied by Michael Edmonds, premiered it in the Purcell Room (London) in 1985. The suite Birds (written in 1977) consists of three sound-paintings depicting the characteristics of their subjects; they are not based on bird-songs - few birds have songs that are readily translatable into music and recognisable to non-ornithologists, but the three chosen here have identifiable traits. Swallows are graceful, swooping in flight - the 'chiming' notes that begin the piece, reappearing twice, suggest that they are circling a church tower. Finally they vanish into the blue. The swan too is graceful - but in a different way, floating gently (on an undulating bass line) and displaying the beauty of its (melodic) curves. It is also popularly associated with sadness and there is a corresponding vein of sad dignity in the music of this portrayal. One would hardly choose the swan for the character of its song; legend has it that the swan only sings when it is about to die! In this piece there is no death scene, the swan simply floats gently out of sight. Sparrows are gregarious, noisy, unpredictable in their movements (the rhythm of the opening section, which serves as a rondo theme, is irregular), quarrelsome and cheeky. All these characteristics are portrayed in the music, an antidote to the swan's solemnity. If, in its proper sense, the term 'classic' refers to something that is a model of its kind, and that is has survived the test of time, the songs of George Gershwin are indeed 'classics'. Paraphrasing Constant Lambert, they may also be described as 'popular and congenial art-songs'. Most of those included in this recording were written for Broadway 'musicals' (Summertime is from his opera Porgy and Bess), but they belong to an era in which the best popular songs were truly art-songs, in which imagination, inspiration and craftsmanship shaped both the music and the lyrics, an era in which Gershwin kept company with Jerome Kern, Richard Rodgers, Cole Porter, Irving Berlin and others. I have given them jazz-tinged settings, exercising a little 'arranger's licence' with the harmony and interpolating (in Nice work if you can get it, Somebody loves me, and By Strauss) a few other tunes, not all by Gershwin. Affection and enthusiasm have attended this pleasant work, for this was the popular music of my own youth! The 'Five quiet songs' which commence this recording were originally dedicated to Peter Pears and Julian Bream, and are settings to music of poems by George Meredith, Thomas Hood, Walter de la Mare, Edward Fitzgerald (translated from Omar Khajam) and Hilaire Belloc. Their essential preoccupation is, as the composer observes in his liner notes, with 'human mortality and transience', and were written shortly after the death of Ida Presti. Felicitous in their sombre harmonies, the songs are material par excellence for a sensitive singer and equally sensitive accompanist; and, by the same token, dangerous ground for artists of humdrum awareness. But no such danger here. Fox's superb voice is matched only by her ability to get inside her material completely – note particularly the opening of Hood's 'Silence' with 'There is a silence where hath been no sound; There is a silence where sound may be; in the cold grave, under the deep, deep sea . . .' One is absolutely overtaken by this beautiful singer, perhaps forgetting briefly what a fine job Burley is doing. He makes an excellent foil, firm where necessary, yielding elsewhere, his fine tone and phrasing surely creating the background to delight a vocalist. He displays his talents as a soloist in 'Idylle pour Ida', appropriately chosen, a whimsical work at times possessed of a melancholy lyricism, at times seemingly mischievously humorous. Not an easy work, but one that the performer executes with apparent ease, his facility rendering the piece unforced, encapsulating both its gentle and passionate aspects. 'Friends and lovers', written for Jacqui Fox, includes the title song 'When first we met'. Intelligently and economically written for voice and guitar, the songs serve as a demonstration of how to compose for this pairing in a succinct and interesting fashion. They are performed here with wit and feeling; I can't do better than to quote Duarte again: 'These performances of my music are the kind that every composer hopes for – but rarely has the good fortune to hear. I can't speak for George Gershwin but I'm pretty sure he would have joined in the chorus of approval'. Of course, Duarte has already elected to speak for Gershwin, if not exactly on his behalf, by his settings of eight of the songs. JWD has had a lifelong love affair with jazz and the old classic standards, and there is an increasing contemporary interest in the music of Gershwin, a genius whose brother Ira had much to do with his success. His songs are the kind that translate into many mediums, much as the Beatles' songs. In both cases one sometimes desperately wishes that the exercise hadn't taken place; but the point is made, nevertheless, of their universatality. There was never any chance that the present set would be anything other than a success, and Duarte has not restrained a creative impulse to incorporate fragments of other songs; for example, in 'Somebody loves me' I suddenly found myself humming 'I got rhythm, I got music' and it seemed natural enough. Fox finds herself humming in 'Love is here to stay'; the effect of casual melody is clever. Her voice is burnished and fire-warm and delivered with such richness of purpose that in 'They can't take that away' she certainly poses the question 'Can they?' for us. Two guitar solos create a nice interlude, with Ray (musically anyway) requiring nobody to watch over him. Nice work, and he got it alright. He is then rejoined by Jacqui whose 'The man I love' is impassioned, and again delightfully ambiguous – 'Still, I'm sure to meet him one day' conveys the overriding impression that she is less than entirely certain. This is art. 'Summertime' could be nothing but straight, a showcase for a lovely voice, while the concluding 'By Strauss' is a humorous and lively finale. 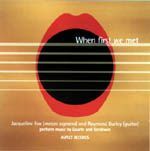 The vocal album 'When first we met' pairs eight Jack Duarte concert arrangements of Gershwin tunes – if you can resist any of this, you've a heart of stone and an ear to match – with two of Jack's own fine song cycles (Five quiet songs and Friends and lovers) and a single example of his solo guitar writing. The Duarte songs have been an unconscionably long time finding a commercial performance on tape, and have some magic moments any singer – and any audience – will enjoy discovering. Burley is a terrific accompanist, and by definition a terrific accompanist is a terrific musician.